Taylor Woodrow’s Nottingham Express Transit 2, Whitechapel and Victoria Station Upgrade teams have recently all been recognised in industry awards. 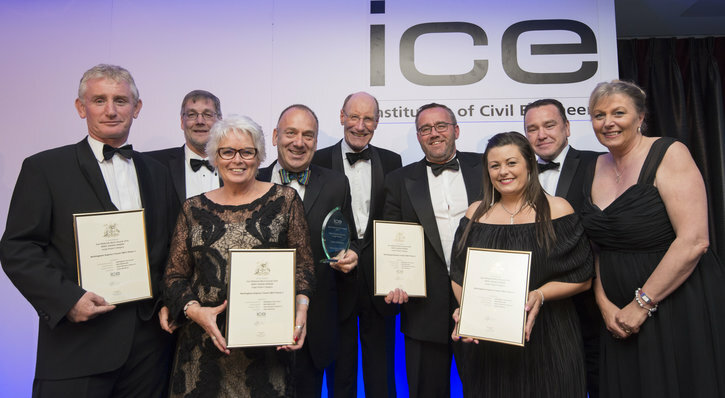 The Nottingham Express Transit 2 (NET 2) team scooped the Major Projects Award at the ICE East Midlands Merit Awards ceremony. The team were presented the award by Sir John Armitt, President of the Institution of Civil Engineers. The judges cited that ‘NET 2 was now an excellent benefit to those living in and travelling to Nottingham; there was an excellent use of local suppliers and contractors; the design was integrated with the local landscape; it provided apprenticeships, internships and work experience for local people; there were innovative bridge solutions….and the project website kept local and interested people informed. Whitechapel and Victoria Station Upgrade were recognised at the Ground Engineering Awards. Whitechapel won UK Project with a Geotechnical Value of up to £1M for their West Lift Lobby propped excavation scheme, which is one of the smaller but highly technically complex elements of ground engineering on the project, with the excavation located in disused roads between the east and westbound Hammersmith, City and District line platforms within the station. Victoria Station Upgrade were highly commended in the UK Project with a Geotechnical Value of over £3M category for their work with consultants Tony Gee and Partners on the construction of a propped slab to form the roof of the District and Circle lines underpass. The slab sits within 0.6m of the running rails of the District and Circle lines, and work involved a six-day closure of the District and Circle lines over Christmas 2014, as opposed to 17 weekend closures using the construction methods originally proposed. Congratulations to all three teams for this well-deserved industry recognition.